I read my first Barbara Pym in 2010. Excellent Women is one of those books that had a huge impact on me when I read it, so much so that I was a bit worried about reading her again. But Open Road Media is releasing several of Pym's books on e-book, and A Glass of Blessings just sounded so good that I went for it. Wilmet Forsyth lives with her husband and mother-in-law in a fashionable part of London. Wilmet doesn't have a job, which is fine because she doesn't want one. She also doesn't have children, which is fine because she doesn't want them. However, sometimes she wishes she had either a job or children so that people would not wonder how she fills her life. Wilmet and her husband fell in love in Italy during the war and married, but lately, Wilmet doesn't feel that they have much in common. When her best friend's husband and brother both start displaying interest in her, she gets excited in a way she hasn't for quite a while and starts going on excursions without her husband's knowledge. She also becomes more and more involved in her church and gets to know the many people there over the course of the story. The great thing about this book is very similar to the great thing about Excellent Women. Both of them are so realistic and human in their portrayal of of people's lives that it is hard not to get drawn in and invested in the story. I had a conversation with one of my best friends once when she got engaged. And she said something to the effect of, even though she is in love and doesn't want to be with anyone else, that doesn't mean she won't ever be attracted to someone else and maybe flirt a bit. And that's really so much of what this book is about. Wilmet loves her husband, but she misses the thrill of feeling wanted, and dating, and going out, and meeting new people. 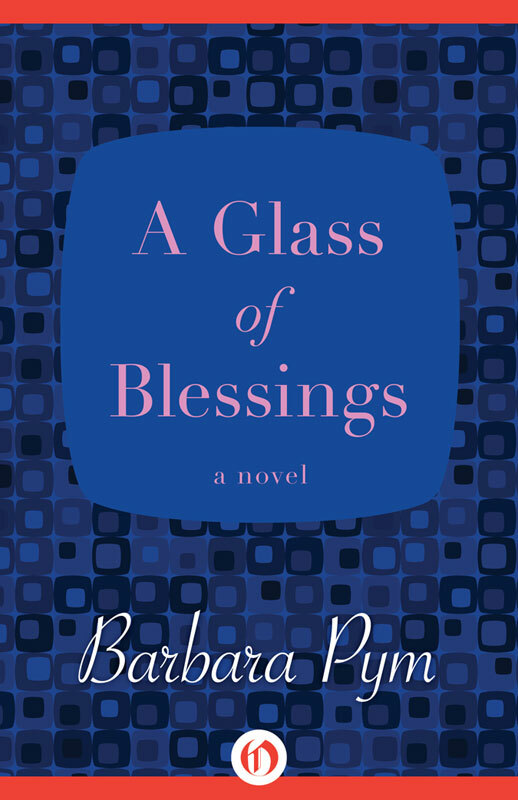 Really, A Glass of Blessings is about exploring those paths that we did not take, and coming to terms with the life we have chosen. Nothing earth-shattering happens to Wilmet or her friends, but nothing earth-shattering happens to most people, and all of us manage to make it through life with a hearty dose of good memories to balance out the regrets. I think this is one of those books (and Pym is one of those authors) that will appeal greatly to some people and others will wonder what the fuss is all about. It's a quiet book of getting through life and making the best of what you have, which is a good lesson for all of us to learn, really. Visit Open Road Media's Barbara Pym page for more information on the author and her books. This sounds so, so good. I'm always on the lookout for stories that acknowledge that committing to someone is a choice - it's not that you'll never ever feel attracted to other people or that you couldn't have followed different life paths that would have made you just as happy. But this is what you chose, and it's sticking around day after day and making memories and creating a history together that makes it the right choice. I really need to read more Pym. I received this book for review as well, and have never read Pym before. It seems like she has a way of getting to the heart of her character's struggles, and that the book was very enjoyable. It also sounds simple, and not to emotionally messy, which excited me even more! I can't wait to see what you think of this one, Heather! I look forward to your review. I've read only three of her books, but am hoping to read them all in this her centenary year. This one sounds so wonderful, and I love the title of your post. Those are my favorite kinds of books - normal life. This is only the second book by her that I've read, but I think her ability to focus on the small things in life is what makes her so great. And glad you appreciate the post's title, too! The Virago Group is celebrating Barbara Pym's writings this year on LibraryThing; I haven't been following it myself, but must get over to have a look, as she is a particular favourite of mine. I can't actually remember if I've read this one though, so I must also take a peek at my shelves: thanks for the nudge. Of course! And I should look into the Virago group on LibraryThing, too. Pym is so celebrated around the blogosphere that I feel very bad that I haven't read her as of yet. Thank you for the recommendation for this one. I've kind of always wondered about Barbara Pym, I see her books all over the place but have never read one. I noted down Excellent Women, since you were so impressed with it. Ah, just read this one recently myself! I do like Pym, and found this story of Wilmet, where not much actually happens, quite wonderful. Love the way you've summarized it.